We are sitting in a cafe on Rue des Lavandìeres Sainte Opportune in the first Arrondissement, having coffee (M.) and hot chocolate (me) to warm up on a cold, wet, windy day. We've been dodging intermittent heavy rain accompanied by strong wind, which has been interspersed with bright sunshine as the heavy grey clouds are being blown across the city in tattered rags. It's been a day to mostly stay indoors, but we had to brave the elements a bit to walk between the things we've done. Just a few minutes ago we walked near Hôtel de Ville, where François Hollande, the brand new French President, was giving a speech after his inauguration earlier today. We saw him on a giant TV screen, and there were police all over the place, gendarmes in bright blue uniforms and caps, and also other police in armour and with machine guns. A street we just walked down was barricaded off, with police keeping the public back. It looked like a motorcade was ready to start after the speech, with dozens of police motorcycles waiting in front of the building. We met Jan at his hotel this morning at the arranged time of 10:00. We arrived a bit early, having caught the Metro to Poissonìere and walked the short distance. It was an interesting walk, since the map indicated simply going up one street then turning at the next corner. But the "corner" turned out to be our street passing over the intersecting street on a bridge! We had to climb down steps to reach the street his hotel was on. Just a few seconds after we sat in the lobby, Jan arrived. We swapped gifts, us giving him the talking koala and liquorice allsorts from Sydney, and him giving us three different varieties of Dutch chocolate biscuits. We left to catch the Metro to the Cité stop on the Île de la Cité and head from there to Notre Dame. The weather started sunny, but turned windy and cold quickly. 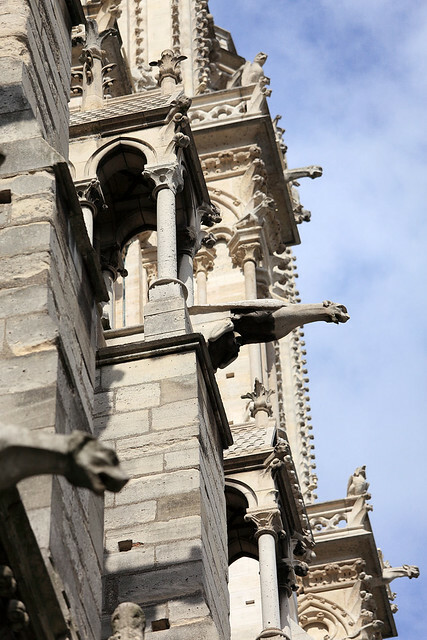 We reached Notre Dame and found a queue of people waiting to go up the towers. We decided to join in and do that first, then look around inside the cathedral afterwards. The queue stretched about 20 metres to the entrance. The day was really cold, the forecast maximum being only 12°C, compared to yesterday's 20°, and as we waited a strong wind began howling across the river and along the side of the cathedral on which we were standing. What's more, the queue seemed to be completely stationary. A guy came past with a handful of leaflets printed in about six languages (indicated by the colour of the paper). We took English ones (green) and they described the route up the stairs and through the towers of the cathedral, also giving a bit of the history of various parts of the building. The leaflet also said (though I only noticed when reading it carefully afterwards) that visitors were admitted in groups of 20 about ten minutes apart, presumably to control the numbers in the cramped spaces atop the building. We had to wait for about three such groups to go through before us, and we ended up being cut off just short of the group before us, which removed anyone from standing in front of us in the queue and providing a windbreak from the bone chilling wind. Ten minutes later, we were much relieved by being allowed to enter the building. We climbed a short spiral staircase to a room where the ticket counter was and bought our entrance tickets there for €8.50 each. Jan insisted on paying for all of us. 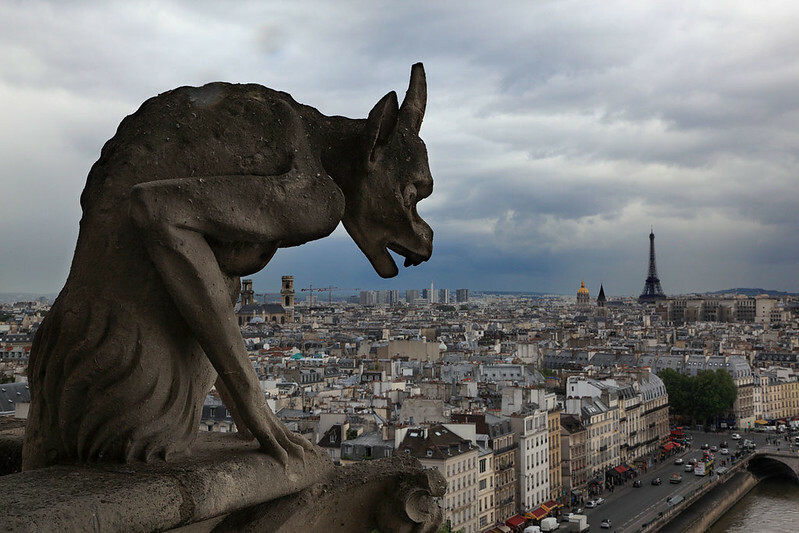 Once everyone in the group of twenty had paid, we were allowed to continue climbing the spiral staircase, which wound upwards interminably until it finally let us out on to a walkway with a spectacular view of Paris below, complete with gargoyles and chimerae leering out over the city. Everyone paused for photos before shuffling along the narrow path between the enclosing waist-high walls of stone. We were on the walkway atop the central part of the cathedral, which connected the two towers that still loomed above us. After crossing to the south tower the path forked. We took the left route towards the belfry, which led us inside the tower and up a short flight of heavy wooden steps to the largest bell in the cathedral. This bell sits alone in the southern tower, while all the other bells are in the northern tower. It is supported by a framework of thick cross-braced wooden beams that descend into the depths of the building below. The wood absorbs the vibrations of the bell, so that it doesn't shake the stonework to pieces. From here we climbed the short way back down and out to the walkway again, then took the right fork, which led up to the top of the south tower. Here a guard with a walkie-talkie communicated with one at the top to ensure one-way traffic up and down the tight spiral staircase. This was much better than in Germany where we'd been up a similarly squishy staircase with people going up and down at the same time and having to literally squeeze past one another on the steep steps. Emerging at the top, we had the exposed square walkway around the tower almost to ourselves. 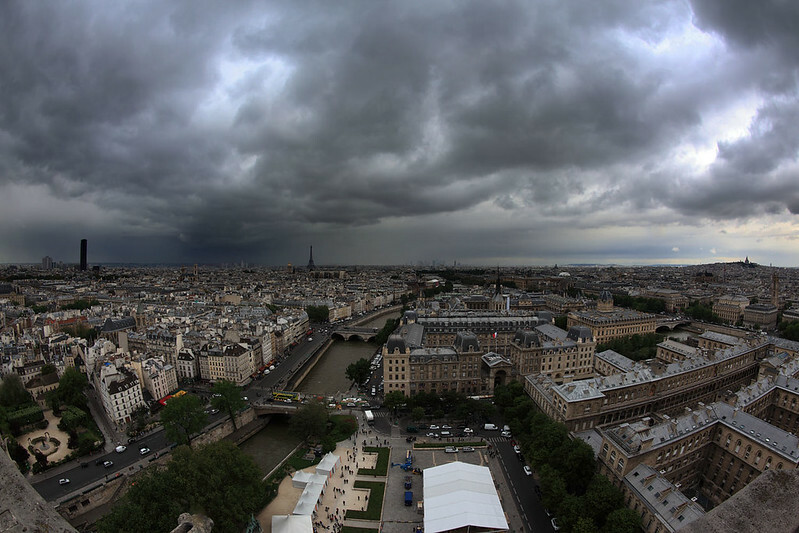 The wind was howling and the sky was dramatically grey, with obvious rain squalls dotting the horizon all around the panoramic view of Paris. It served as a great backdrop for the gargoyles and we took our time doing the circuit of the tower. A few minutes later it started spitting rain, and from the look of the sky we knew it would get heavy very quickly so we moved to the exit and thankfully were allowed down by the guard after only a few seconds wait to let another group of people emerge from the staircase. We ducked into the cover and climbed down to the ground level. When we emerged from the long staircase, we were on the opposite side of the cathedral to where we'd entered. The rain was now lashing down, carried on a cold, strong wind, which was thankfully from the north so we were partly sheltered on the south side of the building. 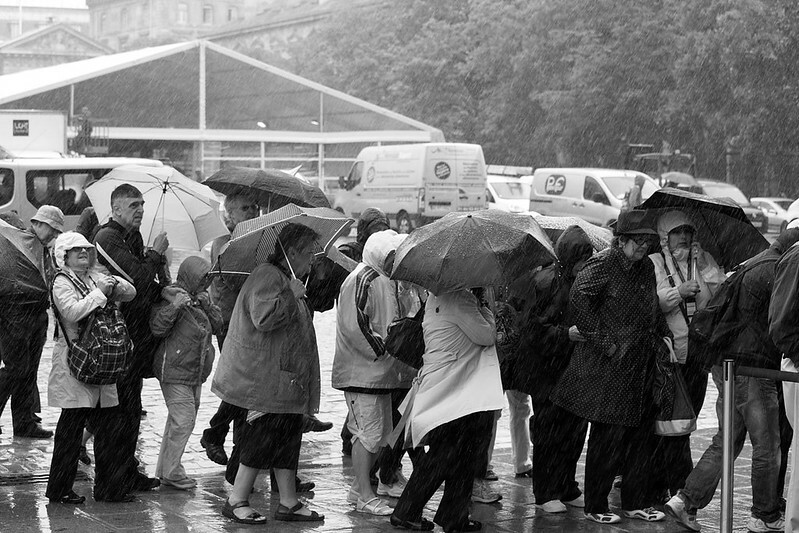 We wanted to go inside the cathedral itself to escape the weather for a while, but from where we stood in the shelter we could see a queue of people huddling miserably under umbrellas braced against the gale, waiting to be let in. The area we were standing in was inside a one-way exit turnstile (to prevent people climbing up the exit staircase to the towers), and offered the only close shelter from the rain, so we stayed there for a few minutes. Some people saw us there and tried to enter the gate to gain shelter, but were stymied by the turnstile and raced back somewhere else. The queue to enter the cathedral moved along and was joined by fewer people as the raging weather continued, so eventually we made a dash for it and joined the back of the queue, umbrellas open. It took us about a minute to move forward enough to reach the shelter of the cathedral entrance, and then we were fine, shuffling along into the interior and escape from the elements. The cathedral was packed with people near the entrance, and the crowd thinned out only a bit as they moved around the interior, gawking at the decorations, the architecture, and the magnificent stained glass windows. 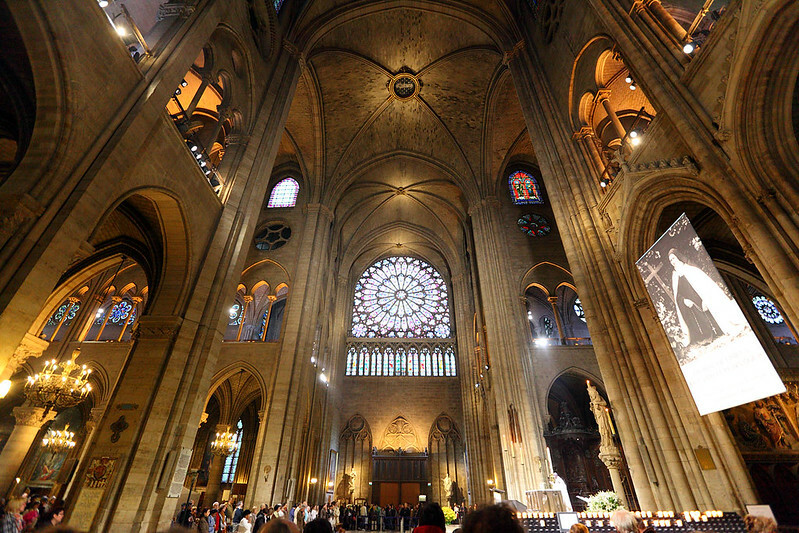 This was clearly a cathedral of light, or at least it would be in sunny weather, with a soaring vaulted ceiling way above allowing huge windows on the walls above the more enclosed side aisles. The arches and columns gave a feeling of airiness and lightness to the structure, which seemed to float rather than rest heavily on the ground. A service of some sort was in progress, with some people sitting in the central aisle listening, while tourists moved around them in a great circle like sharks. 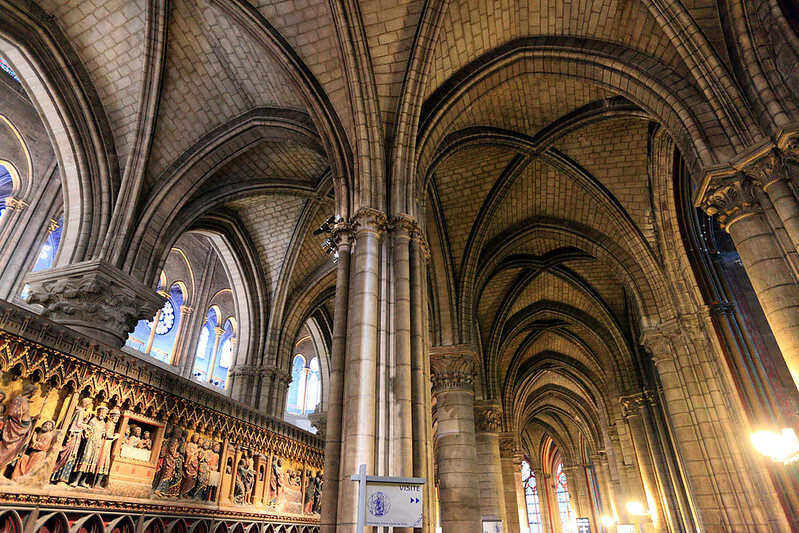 Inside Notre Dame. View across the transept, not down the main aisle. Everyone stopped at the transept, where the side walls opened up to provide room for absolutely enormous rose windows, one on each side. These were stunning, in brilliance, colour, symmetry of design, and sheer size. After taking the obligatory photos we continued circling the cathedral anticlockwise. At every step there were new things revealed through the arches or in the chapels on the sides, and we knew it was raining outside, so we took our time. At the very back of the cathedral, Jan lit a candle in a chapel with a statue of Mary. Continuing around the north side, there were displays on modern poster boards about St Théresè of Lisieux, who dedicated herself to the Face of Jesus as seen on the Veil of Veronica. There were also machines that vended souvenir medallions in exchange for euro coins. These reminded me of slot machines, and felt just as incongruous. Jan commented on the hypocrisy of them too. By now the service ended and the altar emptied and the central seating area was opened up, so we sat for a while to appreciate the architecture and stay out of the rain a bit more. Eventually we decided to see what the weather was like outside. When we emerged, the rain had stopped and there were large patches of blue sky again. Jan said it was good that he'd lit that candle. We walked into the square in front of the cathedral to get our first real view of the front facade. We needed some lunch and also a toilet stop, but we didn't want to stop in for a big restaurant lunch, so we decided to go into a cafe and get a drink and use the toilet, then go out and grab take away sandwiches at a boulangerie. 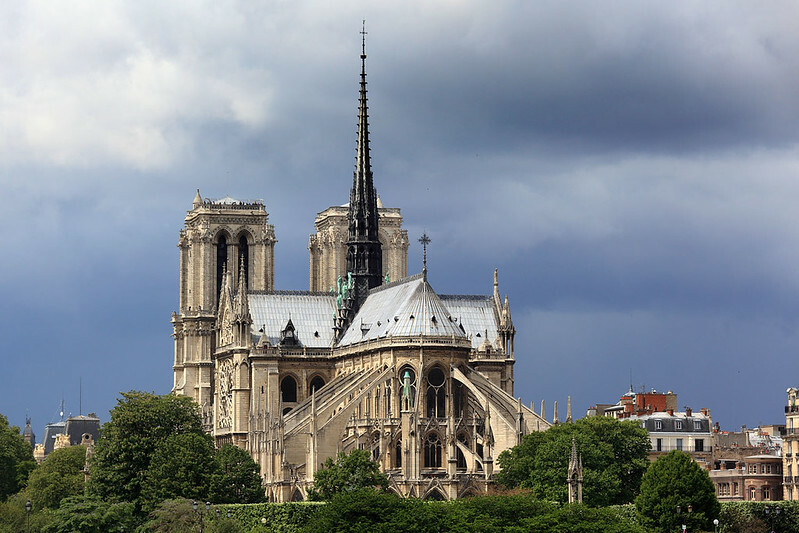 We walked towards the bridge connecting the two islands in the middle of the Seine, which gave us our first view of the back of the cathedral. 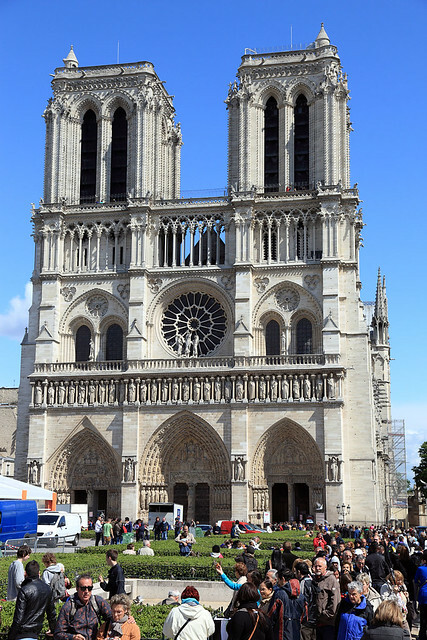 It looks very different from the monumental front, with the domed shape of the nave visible, supported by external flying buttresses, it looks more organic and skeletal. On this side a Japanese couple were getting wedding photos taken, her in a traditional looking white dress and him in a spangly white suit and shiny patent leather white shoes. The suit almost looked like it had sequins on it, the cloth being of a fabric which had small shiny white dots in rows all over it. They stood with the rear of the cathedral as a backdrop and a photographer was snapping away with an assistant holding a lighting soft box. We crossed the bridge connecting the islands and walked down the central street of Île Saint-Louis to find some food places away from the tourist crowds. We ducked into a cafe on a corner and I tried a Grimbergen beer from Belgium on Jan's advice, while M. had a coffee. I saw other tables getting bowls of chips so I ordered one of those too since I was hungry. After finishing the drinks and using the loo, we paid and left, then found a boulangerie around the corner, where we got baguette sandwiches, Jan and me ham and M. Camembert. 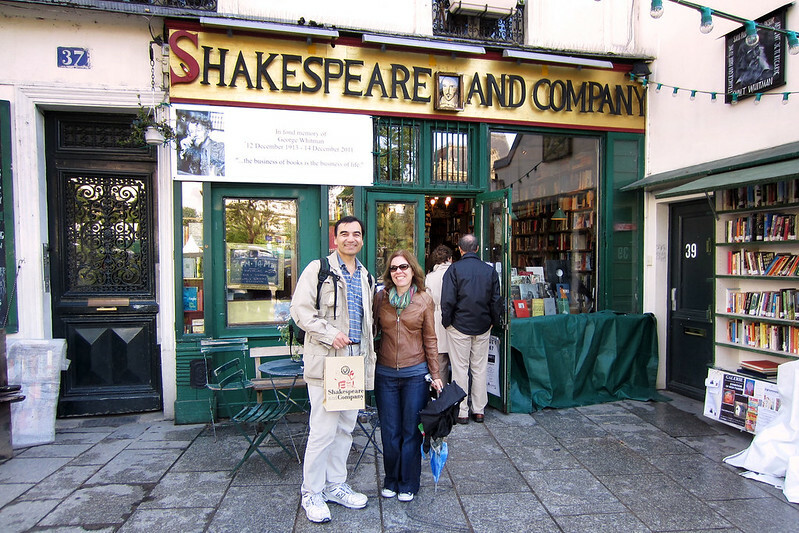 We munched these as we walked across to the left bank, aiming towards the famous Shakespeare & Company book shop in the Latin quarter. We passed La Tour d'Argent, the famous restaurant, and stopped to take a photo. Unfortunately it started raining fairly heavily again and we stopped to take shelter under a marquee set up over some tables outside a restaurant, which thankfully wasn't open so nobody appeared to shoo us away. A few other people gathered there with us as the rain continued. Jan pulled out plastic bags to weatherproof his gear and was ready to brave the rain in his jacket, while M. and I had umbrellas. As the rain eased a little, we walked, but were forced to stop for cover again maybe a block later as it intensified once more. Jan pointed out that it wasn't merely rain, but included tiny pellets of ice, which bounced and skittered on the asphalt. We weren't exactly sure where the book shop was either, so had to hunt a little in the tiny streets around the area until eventually we found it, facing the Seine, and huddled inside to escape the rain and cold. It was cosy inside, and cramped, especially given several other people evidently had the same idea to browse rather than walk in the rain. The shelves were close together and piled high with books, new and used. The oldest books were upstairs, as was a piano which customers were welcome to play, though nobody was playing it today. As we went down, a woman with a violin or something came up the stairs, and M. said later that she'd been playing music up there. Signs indicated there was a gig happening at 15:00, which had been scheduled for outside, but it had been moved upstairs because of the weather. I ended up buying the science book The Canon, mostly just to get the famous Shakespeare stamp inside the cover. But the time we left, the rain had cleared and the sky was blue again. 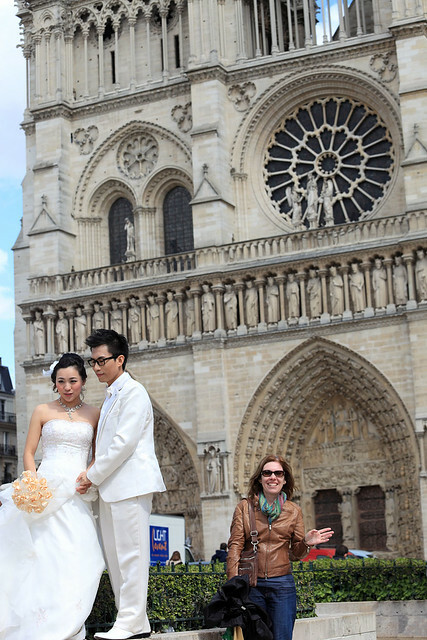 We decided to walk back to the other side of the river via Notre Dame again. This time in front of the cathedral we noticed a large marquee set up, with signs advertising a Fête du Pain, which Jan found amusing by reading it as a Festival of Pain. It was some sort of bread fair, and Jan said he'd read something about an attempt to bake the world's longest baguette. We checked the tent to see if there was any enormous baguette in evidence, but didn't see any. It looked like the thing was just in the process of being set up. Near the cathedral we saw the same wedding couple were still there having photos taken! Only now they had moved to the front of the cathedral instead of around the back. They posed for several more shots there, and I tried to get a photo of the cathedral with them in the foreground. After a while they changed bouquets - there was a guy there with a big suitcase and it had bouquets in a range of different colours! Then they finished shooting and someone ran up to the bride and covered her with a big, thick jacket. Her dress was sleeveless and off the shoulders, and only then we realised we were standing around in woolly fleeces and thick jackets and still feeling the biting cold of the day. She must have been freezing. We saw people on top of the cathedral where we'd been earlier, and Jan tried waving at them to see if anyone would wave back. He said he often tried that with random people far away, since waving made you easy to notice. From there we walked north towards the bridge back to the right bank. Just before it we found the flower market, which M. and I thought deserved a look. Here Jan decided to leave us for the remainder of the afternoon after we arranged to meet again for dinner somewhere near his hotel at 19:30. The flower market seemed partly packed up, with no stalls selling fresh flowers, but several places that looked more permanently set up under marquees displaying other plants in pots. We ducked into one just as the rain started pouring down again and perused its displays of orchids, carnivorous plants, and other exotic things. We walked through three or four such shops under the one long marquee, emerging at the northern end near the bridge. It was still raining, so we waited a bit before braving it and crossing the bridge. From there it was just a few blocks home, past the fashion shops on Rue de Rivoli. M. stopped in at one called Desigual, which featured bold, colourful patterns on its clothes. Once back home, we showered and rested a bit before heading out to dinner. 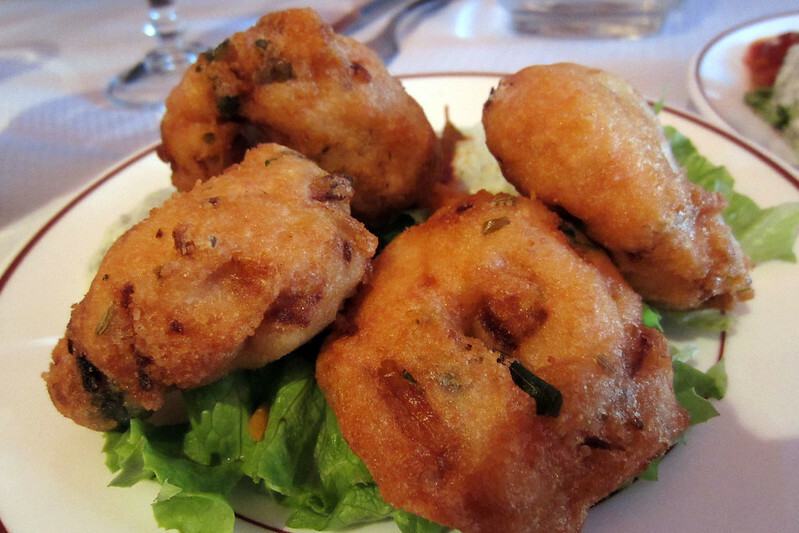 I searched the Lonely Planet for somewhere to eat near Gare du Nord, and found it was a hotspot for Indian food. I used the iPad message app to communicate with Jan and arrange to meet at the Gare du Nord Metro stop rather than his hotel, either near the entry turnstiles, or near the easternmost exit from the station. This turned out to be a very bad idea, as we discovered when we arrived at Gare du Nord Metro station and discovered it was integrated right into Gare du Nord, which was an enormous sprawl of interconnected passageways, stairs connecting at least three levels, rambling concourses full of shops, and dozens of exits separated by hundreds of metres. We waited a while near the turnstiles we emerged from, but realised there were probably turnstiles in a couple of other widely separated places. So we roamed around a bit, finding places from where we could at least have long sightlines. After a few minutes, M. spotted Jan waving from across the large hall and up a flight of steps. She waved back and we connected. She said his waving trick had worked well. Then we headed east out towards Rue Cail, which the Lonely Planet had said was lined with Indian restaurants. Jan had done some searching and found one called Dishny, which he was amused by since we'd said we didn't plan to go to Paris Disneyland, but we could go to Dishny instead. It turned out to be right on the first corner of Rue Cail, and looked decent, so we entered and got a table. We ordered vegetable samosas and some vadai (lentil fritters) for starters, then M. got some dhal, while Jan and I got a beef curry (that's all it was described as in the menu) and a prawn tikka masala to share. We had some rice and paratha to go with it all. We also convinced Jan to try lassi, which he'd not had before. He chose pineapple, I got banana, and M. got mango. The food was good, the prawns being especially tasty. They were whole, not peeled, and we had to cut the heads and tails off. After trying to peel one, I decided to just eat them with the shells on, which was fine, and Jan, though sceptical at first, followed my example. We decided not to have dessert as we were so full. After paying, we walked back to Gare du Nord and said goodbye as Jan went back to his hotel while we hopped on the Metro back home for the night. Last updated: Wednesday, 19 July, 2017; 01:20:54 PDT.